Honor graduate of the Navy “Top Gun” school NAS Miramar. 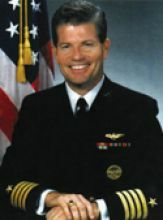 Recalled to active service and served at the Pentagon during the Gulf War. Awarded the Defense Superior Service Medal.